Kool ‘n’ Soothe provides instant cold relief from swelling, bruises, sprains and fever. Unlike traditional cooling methods such as a wet cloth or packet of frozen peas, Kool ‘n’ Soothe requires no refrigeration and stays cool for up to eight hours. It is a cooling gel strip that stays in place so you can move around while still getting relief. It is a hypoallergenic, non-medicinal product that can be used in conjunction with other medications. Suitable for the whole family, Kool ‘n’ Soothe is made of 70 percent water and works with the body’s natural cooling system. As the surface temperature of the skin rises, the heat on the skin causes the evaporation of the water within the Kool ‘n’ Soothe gel sheet. This creates a cooling sensation on the skin. Kool ‘n’ Soothe Migraine is a cooling gel sheet specifically designed for migraine sufferers. In addition to medication, many migraine sufferers seek cooling relief – traditionally a wet cloth. Kool ‘n’ Soothe for Migraine replaces the need for these messy methods. 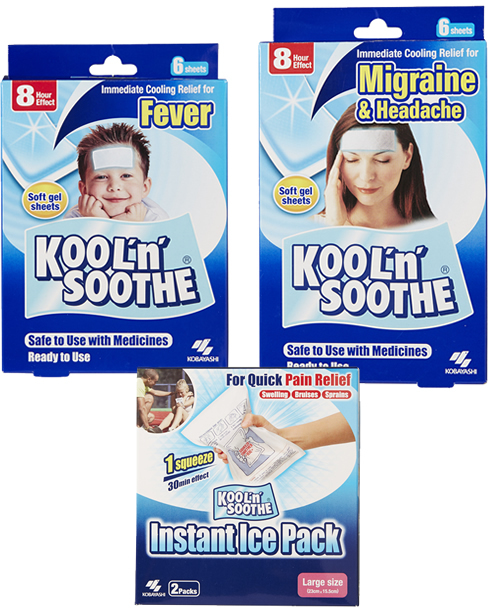 Unlike these other cooling items, Kool ‘n’ Soothe for Migraine stays in place and lasts for up to eight hours. It is ready to use immediately, requiring no refrigeration before or afterwards. It is ideal for migraine sufferers who as looking for long lasting relief. We recommend using Kool ‘n’ Soothe for Migraine at the first sign of migraine or severe headache. It can be used in conjunction with usual mediction and safe during pregnancy. Kool ‘n’ Soothe for Fever is a convenient gel strip that adheres to the forehead and gently cools. It is best used at times of high temperature or fever. It can also be placed on the body to aid restful sleep, for toothache, during travel, or on hot days. It is ideal for use on children because it stays in place, so children can get up and move around while still getting relief. The specially formulated gel requires no refrigeration and is hypoallergenic so can be used with over the counter and prescribed medication. Kool 'n' Soothe Instant Ice Pack is a ready to use cooling pack that provides instant cooling relief similar to an ice pack straight out of the freezer. However, the Kool ‘n’ Soothe requires no refrigeration or freezing. The Kool ‘n’ Soothe Instant Ice Pack is convenient and easy to use. Simply squeeze the activating sachet within the pack and you’ll feel the intense cooling relief delivered instantly. Then shake the pack to mix the content until evenly cold. It is ideal for sprains, strains, bumps and bruises, swelling, muscular pain, headache/migraine, high temperature/fever, insect bites or stings or relief on a hot day.